Yesterday, the news came in that iOS devices might be attacked by professionally programmed Spyware "Pegasus" that is used as a cyber weapon. Apple has already issued a system update: With iOS 9.3.5 you and your iPhone should be safe. But if you want to make sure, you can install the free basic version of the app "Lookout". Its makers, the company Lookout, was part of the team that discovered and researched the spyware. 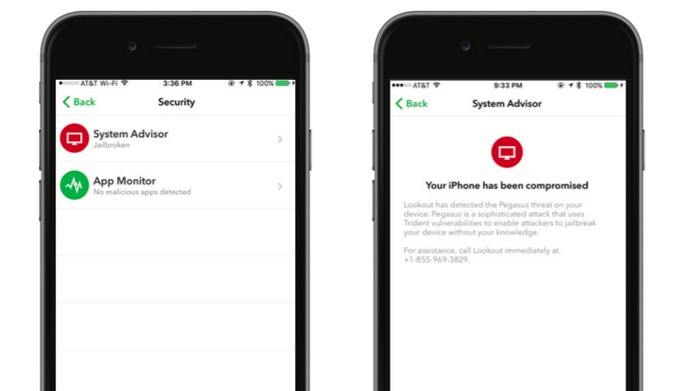 In the "System Advisor", the app will show you whether your system has been infiltrated. If yes, Lookout will provide you with a phone number where you can get further information on how to proceed. Most people, however, shouldn't experience any problems: "Pegasus" has been designed by a company from Israel and is supposed to attack single phones. According to the company, they only sell it to gevernments. As far as we know, the UAE and Mexico has used it so far to spy on oppositionals or journalists.